We're gearing up for our American Bride bridal show this weekend! Come check us out! Our bridal show was a success tonight! Thank you to all the brides who visited our table. It was a pleasure to meet you! This was our first show and we are going to do many more! We had so much fun and we will announce our giveaway winner tomorrow. Today will be our first official giveaway. It will take place tonight at the American Bridal Show at the Hilton Garden Inn located at 800 Route 130, Hamilton, New Jersey 08690. We will be giving away 50 free save the dates to one lucky bride-to-be! Our next giveaway will take place here on our blog in a few weeks! Hmmm, what should it be? Please take a moment and vote for our clients Kristina & Jason! I met my fiancé at a party in my apartment complex. I noticed him immediately and quickly approached. We chatted for hours. Later, he walked me home and gave me a kiss goodnight. I feared I would never see him again. He did not ask for my number and lived in another city. The following day my neighbor Sam knocked on my door and handed me a card he found on his car. The note said “don’t forget about me-I’ll be back in two weeks-Jason” with his number below. Three important details about our Ultimate Wedding. Our wedding, while a focus on us, is also a tribute to those family and friends that have loved us, influenced us, and supported us to become the people we are today. What is important to us is that our attendees have a wonderful time 1)enjoying great food 2)dancing to live music and all in the context of a 3) beautiful venue decorated to perfection. My dream wedding would include live music as there are specific songs that I want to walk down the aisle to and have our first dance to, both of which would sound lovelier live. I would also want buckets of fresh flowers to emphasize our colors and the time of year. Additionally, I would like to have designer bridesmaids’ dresses and groomsmen’s suits paid for so that no one would have to “sweat” the expense of being in a wedding. Finally, I would love to the leave the reception in an antique car. Congratulations De'Shaun & Carl! Your aisle runner is beautiful! Congratulations De'Shaun! Your aisle runner came out gorgeous. We hope you love it as much as we do! 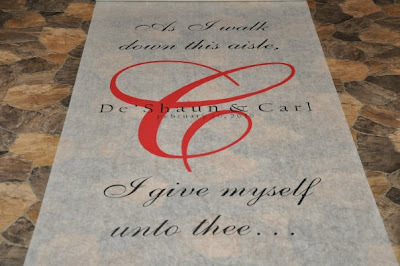 If you would like us to hand paint a runner for your wedding, please contact us for a quote or order directly from our website, http://www.celebrationdesigners.com/.